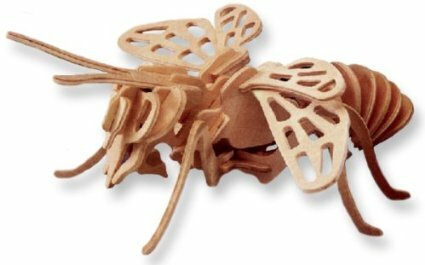 Slightly more than three years ago, a usually thoughtful colleague presented me with a delightful “Wood Bug Craft Kit” for Christmas. No question about it, amigos, this would appear to be a fine gift for anyone who can handle complex tasks like operating a hammer or, perhaps, putting batteries into a flashlight right side up. My idea of a challenging craft project is successfully hanging a wall calendar without getting hurt. Not much of a choice. I knew from past experience how dangerous it could be to try installing a fresh bag in my wheezing practical joke of a vacuum cleaner. And the little wooden bee didn’t seem like it would be all that difficult to assemble. It had only 30 wooden parts and was described as being designed for children 8 and older. Well, I thought to myself, I certainly fit into the latter category. Uh-huh…Sometimes I just have too much faith in my ability to surpass the mechanical skills of the average 8-year-old. The first stumbling block I encountered was that all of the necessary parts were die cut into two thin sheets of wood and, once they were punched out of the flat, wooden rectangles, all the pieces looked pretty much alike. Just how the hell many wings does a “Little Bumblebee” have, anyway? Uh-huh…I learned many valuable life lessons during this seemingly simple exercise in wooden bumblebee building, one of the most important of which is that you should never attempt to eat chow mein while putting together a bumblebee. All the little wooden pieces are attached to other little wooden pieces and they can get seriously lost in your lunch if you’re not careful. The day passed in blissful creativity as I discovered that wooden bumblebees are truly one of nature’s little paradoxes (even without the chow mein). To some casual observers, these insect creations actually may seem to resemble their smaller flying counterparts. To a freewheeling artist like myself, however, they more closely resemble a small lawn chair that’s been mangled by a runaway rototiller – it’s all in how you choose to perceive the little wooden bumblebee space-time continuum as it relates to your special place in the universe.